The 2018 TYC Cup NOR Has been posted! Tradewinds Marina/Yacht Club welcomes you and your family as our friends in boating for the day, the weekend or a lifetime. The Tradewinds Marina/Yacht Club started as a dream in 2004 to make a difference for boaters on Carlyle Lake, now 10 years ago and has grown every since. The marina and the club host a variety of boaters, their boats and our friends, offering slips, a club, a clubhouse, rentals and services the best on the lake so far. Tradewinds comradely is our strength, as everyone is interested in having fun, helping each other and sharing the best of boating. The history in our membership started well before our marina was born, our first group of patrons and members coming from all parts of the lake. The charter members were part of the marinas rebirth from the original abandoned marina of the 1970s, helping to build the new marina and new yacht club. 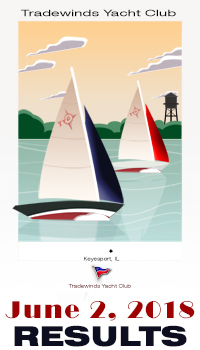 Our initial and continued cooperation with all the marinas and clubs to help address issues for lake management and sharing our and their club events makes Tradewinds Marina and Tradewinds Yacht Club the best investment in your boating hobby and the best choice for your boating home on Carlyle Lake! Welcome aboard! To enroll, please use the "Membership" link to the left. Dues are $40.00 per year per family. You don't need to be a patron of Tradewinds Marina, nor even own a boat to join - just have an interest in boating and having fun! All boaters are welcome. 6-20-2018: The TYC Cup Race Results have been posted. 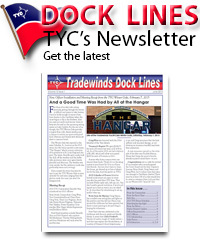 2-03-2018: The TYC Racing Schedule have been posted.